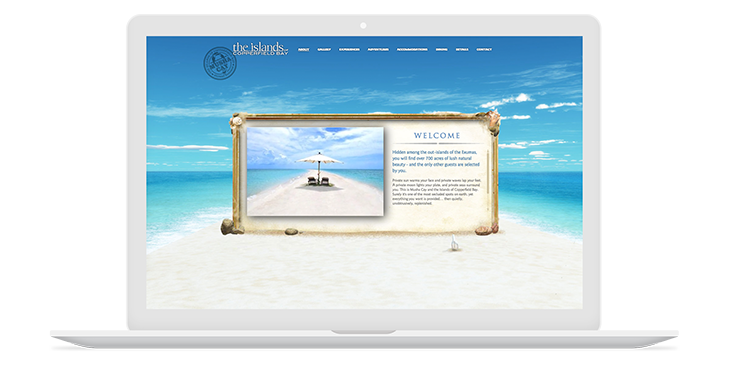 Our agency partnered with David Copperfield’s Musha Cay to create a one-of-a-kind website that offers an immersive experience to anyone looking for an amazing vacation. Hidden among the Exuma islands, Musha Cay is a vacation experience like no other. Owned by world famous illusionist, David Copperfield, the magical vacation destination includes over 700 acres of lush natural beauty, 40 pristine beaches, and 5 luxurious guest houses, where affluent travelers, celebrities, and prominent business leaders can enjoy their very own private paradise. David Copperfield challenged Mediaboom to create a unique one-of-a-kind website that showcased the island’s many incredible locations and features. The goal was to create an immersive and unforgettable experience unlike any other. The Mediaboom team started by gathering photos and maps of the island as reference for creating its digital replica. Designers created storyboards to illustrate the intended animation around the island, with the goal of creating a virtual space where the user would feel like they were actually being transported around the island paradise. The team rendered the island in Vue and used Lightwave 3D to create the models for the birds, dolphins, and other elements around the island. The entire experience was then put together in Flash using the Gaia framework. The developers also built separate desktop & tablet experiences using HTML5 and CSS3 for users who did not have Flash. Mediaboom designed and developed a website for Musha Cay that showcased the island in an incredibly unique way. Our agency modeled a digital island after the real Musha Cay where users can fly around and explore the vacation destination in virtual space.